I got an email from Kara asking if I would "share directions for making a pinwheel block". I directed her to the one already on line, Pinwheel, but she wanted “a basic pinwheel and smaller.” So for Kara here's the basic 6 inch finished (in the quilt) pinwheel block, more sizes below, and there are two more pinwheel blocks at the bottom of the page too. 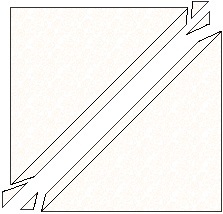 The basic Pinwheel block is simply four triangle squares (a.k.a. 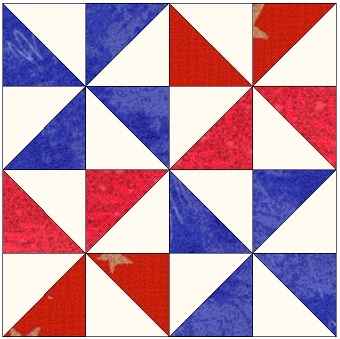 diagonal half squares or half square triangles) put together in a four patch block. To make one 6 1/2 inch (6 inch finished in the quilt) basic Pinwheel block you need two 3 7/8 inch squares of a light color (white) and two 3 7/8 inch squares of a darker color (red). Here are step by step directions to make two triangle squares. 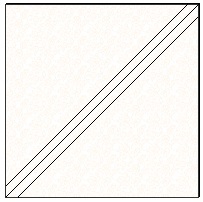 Carefully draw a line corner to corner, (diagonally) through the white or lightest 3 7/8 inch squares. This will be a cutting line when you are finished. 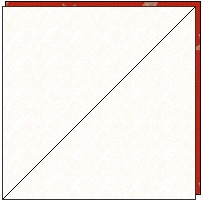 Place red and white 3 7/8 inch square right sides together. If you have a true 1/4 inch foot on your machine, you can sew on either side of the drawn line. If not, you will have to draw a second line on either side, exactly 1/4 inch from the first line. Those will be your sewing lines. After you have sewn on the sewing lines (1/4 inch on either side of your corner to corner to line) you will cut this square in half on the drawn cutting line. Clip off the corners as shown. 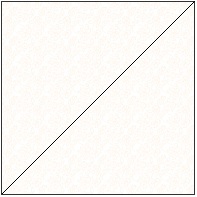 You will now have two triangle squares, which should measure exactly 3 1/2 inches. 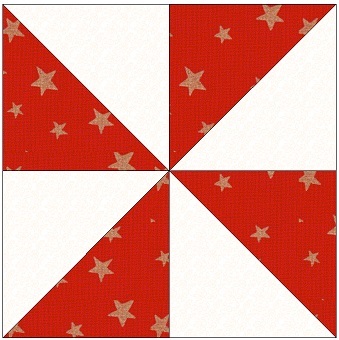 You need four triangle squares for one Pinwheel block, so repeat the same steps. 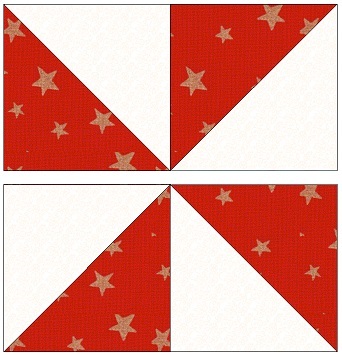 Sew them together into pairs which look like this, and then sew the two together to finish your Pinwheel block. This block should measure 6 1/2 inches. For a finished 3 inch Pinwheel block, cut two 2 3/8 inch squares of each color. For a finished 4 1/2 inch Pinwheel block, cut two 3 1/8 inch squares of each color. For a finished 6 inch Pinwheel block, cut two 3 7/8 inch squares of each color. For a finished 7 1/2 inch Pinwheel block, cut two 4 5/8 inch squares of each color. For a finished 9 inch Pinwheel block, cut two 5 3/8 inch squares of each color. For a finished 10 1/2 inch Pinwheel block, cut two 6 1/8 inch squares of each color. For a finished 12 inch Pinwheel block, cut two 6 7/8 inch squares of each color. For a finished 15 inch Pinwheel block, cut two 8 3/8 inch squares of each color. For a finished 18 inch Pinwheel block, cut two 9 7/8 inch squares of each color. These are finished sizes, after the block is sewn into a quilt. This four pinwheel block is called Simplicity. Cutting your squares 2 3/8 for the triangle squares will give you a finished block of 6 inches. Cutting your squares 2 5/8 for the triangle squares will give you a finished block of 7 inches. Cutting your squares 2 7/8 for the triangle squares will give you a finished block of 8 inches. Cutting your squares 3 1/8 for the triangle squares will give you a finished block of 9 inches. Cutting your squares 3 3/8 for the triangle squares will give you a finished block of 10 inches. Cutting your squares 3 7/8 for the triangle squares will give you a finished block of 12 inches. 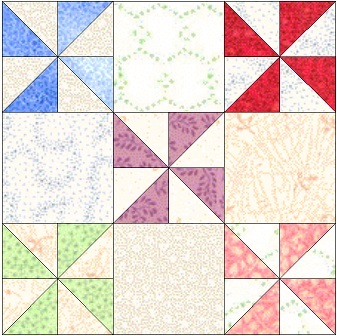 And this 9-patch pinwheel has many names. And if you are so daring to try to make a 6 inch block like this, your squares would be cut 1 7/8 inches to give you a tiny pinwheel that is 2 1/2 inches, the same size of the four solid squares. For a 9 inch block you would cut 2 3/8 inch squares for the triangles, and 3 1/2 inch squares for the solid squares. And a 12 inch block would take 2 7/8 inch squares for the triangles, and 4 1/2 inch squares for the solid squares.